Circus is composed of a main process called circusd which takes care of running all the processes. Each process managed by Circus is a child process of circusd. Processes are organized in groups called watchers. A watcher is basically a command circusd runs on your system, and for each command you can configure how many processes you want to run. The concept of watcher is useful when you want to manage all the processes running the same command – like restart them, etc. REQ/REP – a socket used to control circusd using json-based commands. 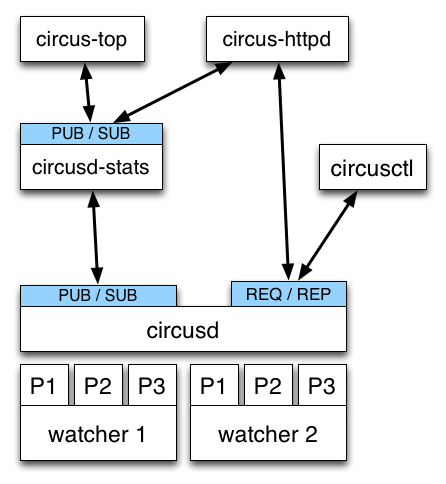 PUB/SUB – a socket where circusd publishes events, like when a process is started or stopped. Despite its name, ZeroMQ is not a queue management system. Think of it as an inter-process communication (IPC) library. Another process called circusd-stats is run by circusd when the option is activated. circusd-stats’s job is to publish CPU/Memory usage statistics in a dedicated PUB/SUB channel. This specialized channel is used by circus-top and circus-httpd to display a live stream of the activity. circus-top is a console script that mimics top to display all the CPU and Memory usage of the processes managed by Circus. circus-httpd is the web managment interface that will let you interact with Circus. It displays a live stream using web sockets and the circusd-stats channel, but also let you interact with circusd via its REQ/REP channel. Last but not least, circusctl is a command-line tool that let you drive circusd via its REQ/REP channel. You can also have plugins that subscribe to circusd’s PUB/SUB channel and let you send commands to the REQ/REP channel like circusctl would.